My good friend & her Group Khindia performing at a community event. Beautiful and pure joy! Ever tune in to a dance show, such as So You Think You Can Dance or the upcoming season of Dancing with the Stars and think to yourself “there’s no way I can do that!” Or maybe, you’ve run into someone who says to you that they have no rhythm and cannot dance. I know I have on many occasions, which has left me pondering; at what point do we start to think that we can’t dance? I bet you (though I”m not a betting woman) that we didn’t feel the same way when we were little. Doubtful? Try turning on some music in the presence of a toddler or even a baby and they will automatically start to move to it without a care in the world. It doesn’t matter whether they’re moving to the beat, if they look good, who’s watching or what they think. They just feel the music and just do it. Is it possible that dancing is inherent in us but as we get older we start to care too much about whether we’re doing it right, look good, our surroundings or what other people think of us that we loose our innate ability to do it? Of course, some of us might be more gifted than others and have a better sense of rhythm. But at the end of the day, dance is about movement, feeling the music, moving to the rhythm (or not), being in the moment, and most of all having fun and feeling happy! Isn’t it time to take a cue from little ones and get back to that place where we allowed ourselves to move to the music just because we felt good doing it? I’ve been enjoying dance classes at the same community dance studio for the last 23 years. The last 10 of those years, I have been driving 50 miles away to get to the studio. Often times, people will say to me that I must be really dedicated to drive that far away alone just for dance. But it’s not just dance! My commitment and passion for the art of dance is driven by much more; it has enriched my life in ways that I never imagined, got me through the toughest times in my life, given me hope when I had none, kept me feeling good about myself even when I had reason not to, and made me a more well rounded human being. In a nutshell, it’s my oxygen. It’s great to be able share the passion and love that you have for something with people who feel the same way. The dance community becomes part of your family and provides a great sense of belonging. In the 20+ years that I’ve been dancing at my community studio, I’ve had the privilege of meeting and fostering relationships with some amazing dancers and teachers and shared in many of their life experiences. From the delightful, such as births, graduations, and marriages, to the tragic and heart wrenching losses of loved ones, it has been a great window into the resilience of the human spirit, wonderful support system, and invaluable life class. Where else can you meet dancers and teachers from different parts of the U.S., Africa, Brazil, Cuba, Australia, Belgium, France, Israel, Japan, and more all in one place? I’ve been lucky to develop long lasting and meaningful relationships with people from diverse backgrounds and all walks of life, which has solidified my belief that we’re really more alike than we are different. Capoeira, Sabar, Rueda, Samba, Congolese, Djembe, Kora, Wolof, Youssou N’dour, Los Van Van, these are dance styles, musical instruments, cultures, and musicians that I would not know if not for my dance community. Through master dance teachers, drummers, events, and performances, I have been exposed to different kinds of languages, traditions, food, dress and more. It has broadened my knowledge and given me a deeper understanding and appreciation of varying cultures. 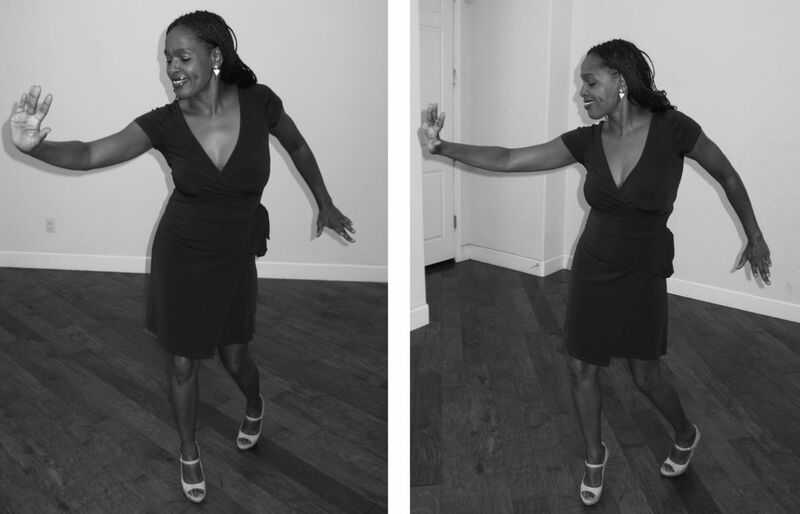 “Awkward,” “silly,” “self-concious,” these are just some of the words I use to describe how I felt when I took my very first Jazz and African dance classes! I was so uncomfortable during and after class that I was sure that I would never return and put myself through what seemed like torture at the time. But something that the jazz teacher said at the beginning of class stuck with me and challenged me to come back and do it again. She asked us to look around the class and to remember that no one in it (not even the more advanced dancers) was born knowing how to do what they’re doing. They started in the same spot as all beginners and worked their way up to where they are today. Suddenly, the dance steps that she was teaching didn’t seem so daunting and with time and practice, the awkwardness and self-doubt peeled away as well. To this day, I use that same philosophy whenever I venture into a new dance style and the same feelings of awkwardness, self-concisousness and doubt start creeping in. It has worked like a charm! Dance challenges you to get out of your comfort zone, try something new, and boosts your confidence along the way. For the longest time, I avoided being the lead in my Rueda salsa classes (there’s always a shortage of leads) because I just didn’t believe that I could it well. Today, even though I still prefer to be in the follow position, I jump into leading comfortably and laugh it off when I make mistakes! In addition, it has made me not only a better Rueda dancer, but also more patient and empathetic towards my male partners since I have a better understanding of their lead role. The benefits of dance are immeasurable! What other activity allows you to burn 400 to 700 calories within one hour and have fun while doing it? Dance has tremendous physical, mental, and spiritual benefits. It’s not only great exercise, but also a big stress reliever and food for the soul! No matter how much I get to dance class kicking and screaming (and believe me, it has happened quite a few times), 10 to 15 minutes into it and I’m in the zone and all the stresses I had coming into class disappear. Even though it’s just for that moment in time, it’s worth it because I come away with a happier, fresher, and more optimistic outlook on life and feeling like I can deal with whatever it throws at me. From theatre performances by various groups from the studio, cultural and dance festivals, shows and parties by dance teachers, to Salsa concerts and nights out with fellow dancers, and birthday celebrations, there is no shortage of social activities and opportunities to hang out and enjoy with friends. Want great legs (yes, there is some vanity involved), to build stamina, more flexibility, better cognitive skills, and to feel and look good at any age? Dance is for everyone! My classes have a wonderful combination of dancers of all ages; kids, teenagers, young adults, middle aged folks, and women and men well above 60! That’s the beauty of dance! It’s an ageless and inclusive art! It does not discriminate! You can choose to dance as long as you want to do it. You may have to adjust the way you do it as you get older but that’s with everything else in life. Anyone who’s ever tried something new understands the frustration that sometimes comes with it, especially when you feel that progress is slow. My Salsa teacher likes to say “little by little” when he notices his students struggling to learn certain moves. It’s a nice reminder that you cannot rush progress. It takes practice, patience and time. Even though you may not be perfect or reach professional status, you can get better at anything! Dance provides a wonderful opportunity to give back to the community. Whether it’s through performances in community events, supporting dance companies, fellow dancers and teachers with their projects, or helping new students in class, there is no shortage for making a difference. Dance is just plain fun! With the sound of loud, beautiful music (live drums in African classes) and the energy and good vibes from the teacher and dancers around you, it’s impossible not to be in the moment and have a great time! For those 30, 60, or 90 minutes, you get to clear your mind and escape to a more peaceful and tranquil place if only for a moment. Dancing to some great salsa music by Los Van Van! Pure oxygen! Ready for to get some happy feet? I say, go for it! I only hope that you will get to enjoy and reap the benefits of the wonderful art of dance as much as I have! Have you taken dance classes before? What’s your favorite? Maybe it’s ballroom dancing, street dancing, salsa, African dance, belly dancing or pole dancing. Whatever it is, we would love to hear how it has impacted your life. Great post! I fall into the trap of thinking “do I look funny?”, but you have to let it go. Sometimes I need a couple of drinks to do so, but getting to the point when I can just let go.